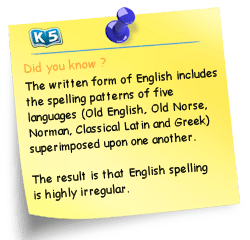 K5 Spelling’s ‘adaptive test-study’ approach, automatic word generation, optimized visual interface, 150,000 word database and continuous tracking of each student's spelling and misspellings is far beyond your typical online spelling program. Traditionally, students are given a list of spelling words to study, then tested and scored. Students learn how to "cram" words into short term memory. No follow-up takes place on the words the student misspelled. A lot of time is invested for a small amount of progress. Our goal is to teach spelling and build vocabulary, not test short term memory or generate quiz scores. K5 remembers every word a child spells or misspells. If a child spells a word correctly the first time, she never sees that word again. If the student misspells a word, the same word will be reintroduced on subsequent days until she repeatedly spells it correctly. Words are generated based on each child’s grade level, past quizzes, and specific goals. There is no need for a parent to input words (though they can if they want). Kids first hear a word (which can be clicked for repeated pronunciation), and can view or listen to an sample sentence. They can also see a picture of the word (if it is a noun!) or read a definition of it. All of this gives kids a chance to absorb the word’s full meaning. Vocabulary is built through the understanding of meaning and context, not through rote memorization. Spelling is a very visual exercise for most kids. They learn what ‘looks right’ and ‘looks wrong’. K5 uses super large fonts to help imprint proper spelling in the mind. Unlike many web sites, we never display a misspelled word, we make it disappear as quickly as possible. K5 immediately reinforces correct spellings with a positive sound and a prompt to go to the next word. In most traditional spelling quizzes, the student finishes spelling all his words before he finds out if he made any mistakes. His take home message is his score, not new words learned. K5 meets a misspelled word with an immediate hint on how to correct that mistake. Two attempts are allowed; then the correct spelling is shown for several seconds before giving the student another chance to spell the word. The student always does a correct spelling before moving on. Any misspelled word is then repeated when your child next visits K5 Spelling. In the vocabulary mode, the student has to first try to guess what the word is, from the definition and the sample sentence (with word blanked out) before trying to spell it. It’s an addictive challenge! We also offer a number of free spelling worksheets for grades 1-5 as part of our free worksheet center. You'll also find organized spelling word lists for each grade there.